RCL Foods is a large, international food producer and as one of the largest food processors in Africa, the company is responsible for a number of local brand names. RCL Foods recently injected vibrancy and energy into its new Durban office by installing a selection of brightly coloured resin floor finishes from Flowcrete South Africa. The new building in Westville’s Westway Office Park was designed to provide a creative environment using materials that would also meet the specific demands of each area. This design ethos included specifying a variety of floors that would cleverly meet both the aesthetic and operational demands of the site. From the moment that visitors and staff enter the building, they are immersed in a colourful and energetic environment. A decorative floor was installed in the lift lobby on each level of the building’s three storey car park using 378m² of the epoxy resin floor coating Peran STB in a sleek, dappled grey colour. The attractive lobby area provides a pleasant transition from the car park to the office. The Test Kitchen, a focal point of the new office, needed to be both practical for cooking as well as aesthetically stunning. 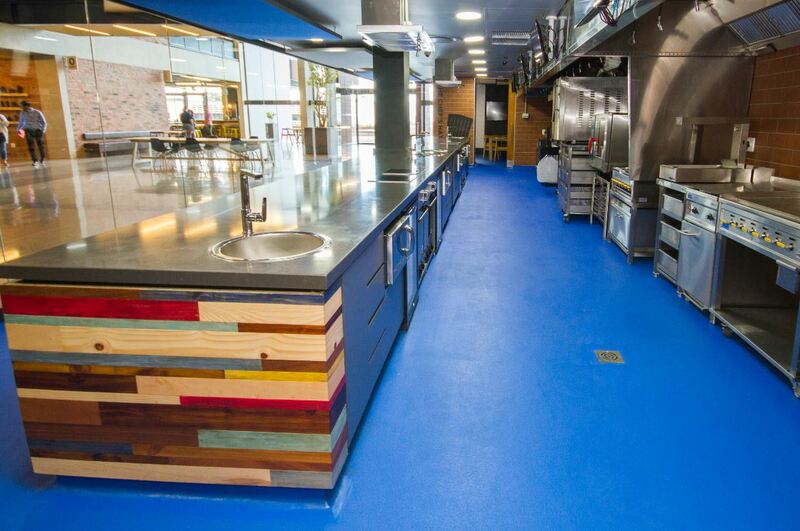 To achieve this, 311m² of Flowfresh SR Ultra in a bespoke blue that matches RCL Foods’ corporate colour was installed to link the space to the visual identity of the business. This durable, HACCP International certified polyurethane system is able to survive the temperatures, spillages, chemicals and impacts inherent to a busy kitchen environment, while providing the highest possible hygiene levels thanks to the antibacterial additive Polygiene*. The interior design scheme was extended across the building, with 272m² of Peran SL Fruity flooring being supplied for the 18 toilets. No two toilets are the same as the designer chose an extensive palette of colours, including Tomato, Kiwi, Grapefruit, Tangerine, Spearmint and Plum for this area. The self-smooth epoxy system is robust and it will ensure that the floors can withstand everything from scuffs and scrapes to foot traffic and cleaning chemicals. With this combination of floor finishes, RCL Foods can rest assured that its new office has a vivid, contemporary and on-brand surface underfoot that is able to withstand the various challenges that such a busy and unique office space can throw at it. For more information contact, Flowcrete on Tel: +27 (31) 461 3411 or via www.flowcretesa.co.za.